China, Zhou Dynasty. State of Zhao. An-Yang square foot spade. ca. 350 to 250 BC. 1/2 Jin. Date : These are dated to the later Zhou Dynasty, ca 350 to 250 BC, but they are most likely from the last half of that period and might even have still been minted under the Chin Dynasty after 255 BC. Mint : An-Yang. 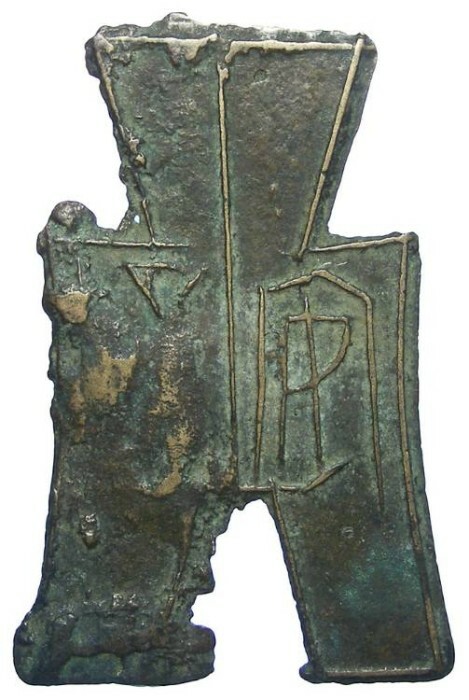 There were a number of cities called An Yang but molds for this type have been found near Baotou in Inner Mongolia which was under the control of the State of Zhao after 300 BC when these were most likely made. Reference : Hartill 3.183. Schjoth #29 variety (where he reads the inscription as Chai-Yang rather than a variation on An-Yang. Size : 45.3 x 29.6 mm. Weight : 5.31 gram. Grade : VF with good metal and patina, but very poorly cast so that the left hand characters is not legible. Obverse : "An-yang" (which is the mint name as discussed above). Reverse : Three vertical oblique lines but no characters.